Harsh with his fellow bloggers have started the Road Trip Journey of 6400 + Kilometres from Delhi to Kanyakumari. The name of this Journey is ShoutMeet. 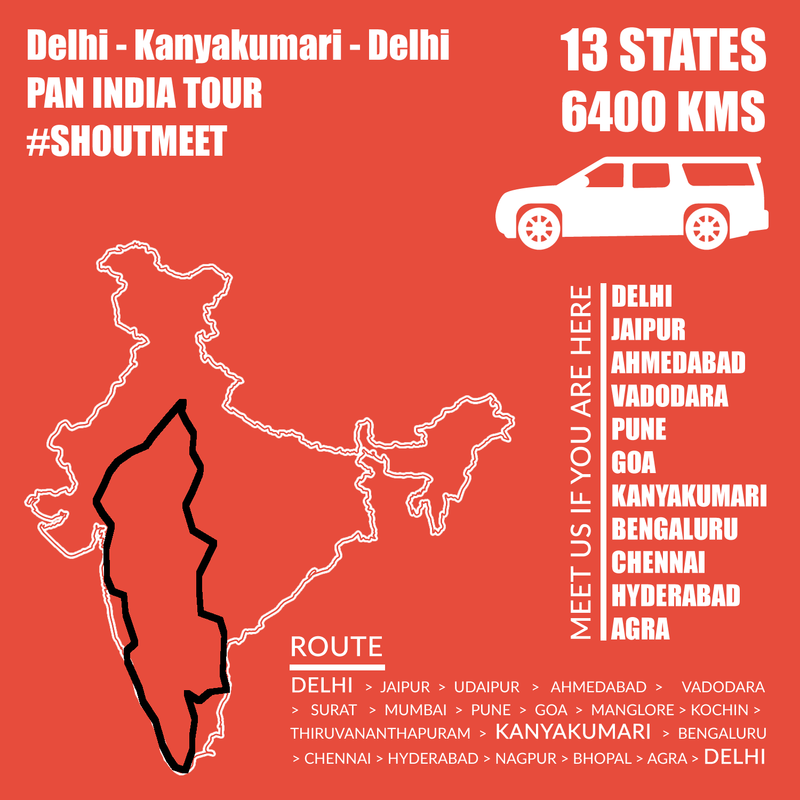 So, ShoutMeet is basically a road trip of bloggers from Delhi to Kanyakumari. In this drive they are organizing bloggers meet in the major cities like starting from Jaipur, Ahmedabad, Vadodara, Pune, Goa, Kanyakumari, Bengaluru, Chennai, Hyderabad, Agra. This ShoutMeet trip will covers around 6400 KMS and will cross 13 States. This ShoutMeet road trip will end in 16 days. Today, they reached the Pune City and now heading towards GOA, if you also want to be a part of this Trip Read Harsh Agarwal’s Article on ShoutMeLoud about ShoutMeet Here and you can fill out the form there also. The speciality of this Meet is that it is a free of cost, anyone can be a part of it and also there are some giveaways also. The Venue for this ShoutMeet in Pune was at WP Poets office at Kalyani Nagar, Pune. Thanks to Amit Singh for conducting this Meet in his office (WP Poet). There were around 35 people who attended this Meet in Pune. Some were Professionals, some were intermediate, some were beginners and some were about to start the blogging. By this Meet many were motivated to start his/her own blog. Thanks to Harsh for bringing this meet in our City. So, Starting with Harsh, Harsh told about his life that how he started his journey from a Call Center to a Professional blogger which inspired us a lot. He also mentioned that how he manage the blog while doing a job, like while travelling he use to read the things and then when we will get time he write it down on his laptop and then upload in his blog. Many other pro bloggers like Manish Chauhan, Vikash etc. shared their journey and struggle. Vikash Khetan founder of Coupon Guru described his journey, how his site was hitted by panda and then how he recovered from it without losing hope and without shutting down his site and then starting a new one. There was a healthy discussion going on SEO, many bloggers gave their opinions on SEO, What is SEO? What to do and what not. Harsh briefly described the SEO in just small words that SEO is actually nothing it is basically how you show your content to Search Engine, So the thing which Harsh told is that work on the Quality of Content than wasting your time on SEO. He also gave many suggestions about Comment Box which one to use and which not. He also clearly mentioned that Social Media is very important for a blog. A Question was asked by Sumesh (Me :P) that how much time really a new blog take because I have ranked my 4 days old domain in #1st page with only 2 Articles in the site and with no backlinks, at this point harsh introduced a new thing which many bloggers don’t know and that was Google Dancing. The name is strange a bit. What actually Google dancing is, it is nothing but Google ranks the new blogs for a period of time and then he keeps checking the quality of content, according to that he ranks up your site. There were many people who were not bloggers but they were motivated and inspired by Harsh and other bloggers that they too decided to start their blogs. A big question was raised by me “Should I take Blogging as a Career after my Engineering” Harsh replied it well but still the question remained unanswered indirectly or to somewhat, so I request the readers if you can answer this question your comments are always Welcomed. This Meet was of around 2:30 hrs and the meet was a healthy meet and a good meet I can say. Thanks once again Harsh and others who were involved in organizing this Meet. In the end, some gifts/giveaways were given to the persons who were present there, 2 got free Hosting for 1 year and 2 got a Premium theme and the rest also got some gifts from ShoutMeLoud. 2 Magazine 3 Premium WordPress theme. Some Pics Clicked During the Meet. Amay getting Magazine3 Premium WordPress theme license. It was an awesome learning experience. Especially for upcoming bloggers like me. Harsh was very humble and answered questions very nicely. Thanks Abhinav for giving your Time to read my article and then leaving a wonderful comment..
and yes it was really a nice learning experience..
Nice article Sumesh. I am glad that I beacame part of #shoutmeet at Pune. The meet was very informative & inspirational. Nothing left to speak you covered all points :p .
I wish i could be there, i am sure it would have been a great learning experience. We have Requested Harsh that these kind of Meets should be conducted after some intervals of time and i hope soon they will again organize such kind of meets..